What REALLY Happened To Steam - Now a major project is being launched to set the record straight. Stage 1 Its purpose was:(a) to give access to the three Railway Magazine articles published on 7th October 2009 (in the November issue), on 1st September 2010 (in the October issue) and on 3rd April 2013 (in the May issue). These explain the aims of the HSBT Project and how you can help, so please read all three articles before getting in contact. (b) to give the contact details of the 8 key people involved in the Project. (c) to emphasise that it may not always be possible to answer individual queries. However, for those contributing information, we will try to reciprocate as best we can. Stage 2 of this website. Now that we have been able to absorb much of the information received to date, we are introducing the second stage of the website by the addition of downloadable PDF copies of articles that have appeared in the Engine Shed Society (ESS) quarterly magazine Link. 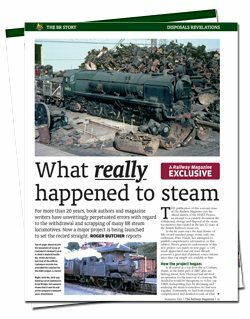 Downloadable PDF copies of the three Railway Magazine What Really Happened To Steam articles were introduced in December 2013. Click here to go to the download page. The HSBT Project team is grateful to the ESS for its positive and continuing support of its objectives. A number of articles, highlighting hitherto unknown aspects relating to the withdrawal, storage and disposal of steam locomotives have been published in Link. It is believed that the subject matter of these articles is likely to be of interest to those following the progress of the HSBT project so, with the agreement of Paul Smith, the Editor of Link, downloadable PDF copies of these articles are now included on the website. Comments or feedback on these articles would be welcomed by the HSBT project team and by the ESS and may be sent to Keith Gunner at keith@whatreallyhappenedtosteam.co.uk for coordination amongst the team members. Thank you for your continuing interest in this Project. Stage 3. What Really Happened to some Diesels. Although the HSBT Project is focused on steam locomotive disposals, it has become apparent that a significant number of published diesel locomotive disposals are not correct. Articles on this topic have appeared in The Railway Magazine and Link. Downloadable copies of these articles are now included on our website click here to view. It is not the intention to publish any books on the subject of diesel disposals. However, once the true disposal of locomotives that have previously had incorrect disposals published is established it will be included on this website.